I’m currently the scientist and coordinator for the Smithsonian MarineGEO Network. I was formerly a post-doctoral researcher at Bigelow Laboratory for Ocean Sciences in East Boothbay, ME, and at the Virginia Institute of Marine Science in Gloucester Point, VA. I received my Ph.D. in Marine Science from the College of William & Mary in 2015. My interests span from community and applied ecology (with an emphasis on seagrasses) to biodiversity science and conservation to ecological statistics. My research is broadly focused on understanding the causes and consequences of biological diversity, especially with respect to human well-being. To help with this goal, I develop new statistical methods and approaches, principally structural equation modeling (SEM). I write and maintain an R package to conduct SEM and teach international courses on the applications of this method. My current work involves implementing long-term monitoring and coordinated experiments across the 13 sites (and growing!) that comprise the MarineGEO network. Our purpose is to catalogue the variety of life in earth’s coastal zones, and also to understand what biodiversity–and its loss–means for these valuable ecosystems. In doing so, I address both fundamental and applied questions in ecology using a combination of observation, experimentation, and synthesis. 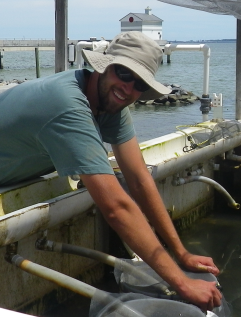 My prior post-doctoral work involved understanding the patterns and drivers of submerged aquatic vegetation in the Chesapeake Bay over the past 30 years, and the factors that drive herbivory on Caribbean coral reefs. My Ph.D. research focused on the application of organismal ‘functional traits’ to both experiments and observational surveys to demonstrate how knowing what an organisms does–rather than what it is called–may help us better describe and predict the consequences of changing biodiversity. Ciao from a Mediterranean time series station in Italy! Nice to see a fellow blogger, ecologist and R-user! Can you tell me where it is, or could you please send me in an email? Also, do you have founction/code for backward model selection for lmer? I have learned so much from your papers about SEM. But when I want to download your teaching materials in this page: https://jonlefcheck.net/teaching/, it always comes an error. So could you sent me a copy of these materials? I’ll appreciate it soooo much!